Although the man tipped to be Britain’s first Black prime minister long ago graduated to a prime place around the table, he retains some humble tastes. Not long ago, for example, he was spotted dining in a mid-market chicken restaurant with fellow Labour frontbenchers. Mr Umunna’s fondness for fast food may be exceeded only by his appetite for reforming the way that Britain conducts its business. Monday marks the publication of a book, edited by him, called Owning The Future. Though he has gathered an impressive collection of business figures to contribute to this study of how globalisation and technology can go hand in hand with fairness, questions remain about how business friendly Labour is. While he admits that initially “some minority in the business community reacted negatively” to Mr Miliband’s early attack on predatory capitalism, they later “started to call out excessive rewards”. But Mr Umunna, channelling Lord Mandelson, has declared himself “relaxed” about people earning a lot of money, as long as they pay their taxes. “You cannot claim to be pro-jobs unless you are pro the people who create them, and that means you must be comfortable with wealth and profit. An opponent of top-heavy government, Mr Umunna, 35, has recently been to Europe to meet his friend, the “brilliant” French prime minister, Manuel Valls. “They [the French] have something like 40 ministers to our 80.” So is he in favour of scrapping whole government ministries, such as communities and the regions? “Abolishing departments is above my pay grade. That is an issue for Prime Minister Miliband. We should look at the configuration of central government. Of course, I have views.” Though he declines to be more specific, it seems clear that the shadow business secretary would prefer a leaner, cheaper Whitehall remodelled on European lines. On the EU itself, he has called for reform, saying not long ago that free movement of workers was not intended to mean free movement of jobseekers. “As one of the most pro-European shadow ministers, I don’t think you can ignore the impact that free movement has had on some of our communities,” he says, adding that it has changed because there are “many more EU members”. Should people not come here at all unless they have a job? “There’s a number of things we need to look at. Those who tend to raise the issue of immigration with me are my African and Asian constituents. They want confidence there are proper controls. If Mr Umunna is hard to pigeonhole, that may be linked to his own pedigree. His maternal grandfather, Sir Helenus Milmo, was a Cambridge-educated high court judge who helped to prosecute the Nuremberg Trials. His father, by contrast, was a Nigerian labourer who arrived in Britain in the Sixties with one suitcase. Having borrowed the fare from Liverpool to London, he worked in a car wash, became a successful businessman and died in a car crash when his son was 13. The hateful abuse Mr Umunna has received from Ukip supporters was provoked not by his heritage but by his suggestion that some of the party’s followers lacked online skills. 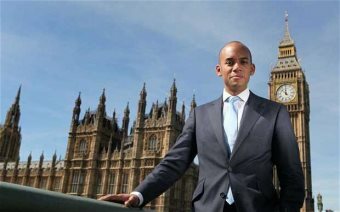 It seems likely, if not certain, that Chuka Umunna is destined to become a larger presence in his party and thus a bigger potential target. For the back row boy once deemed too lowly for a seat around the shadow cabinet table, Big Beast status surely beckons.